Are You a Photoshop Pirate? Wow, Brian, you really nailed it here. I love the use of the same image at different exposures (or adjustment levels) overlaid with the histogram. This really helps to show exactly what is going on with every adjustment of all of the tools. Very well done sir! Thanks Sean, I just hope I made it clear enough to understand. This is one of those topics where you know how something works just by experience, but it’s difficult to get into words and images that make sense. good writeup… but I think it’d be even more complete if you mentioned the fact that all of these adjustments are operations that can be done via curves in PS. I know you were discussing lightroom here as you stated… but it helps me understand these issues to always think about what the curves adjustment is for each knob you’re turning in LR. I suppose you could do these things with curves adjustments, but they’re not really intended to be the same. I’ll be going over the tone curves adjustment found in Lightroom in the next article. And if you have PS, you have ACR (which is essentially Lightroom when it comes to the raw processor). This is a great followup to the first post, Brian. I like your step-by-step approach. This is really helpful. Thank you. I keep reading “recipes” on how to use these sliders, but never before any good explanations on what they do. I have one quesition — what’s the difference between using the contrast slider and using the point curve in ACR? They seem to give different results, and I’m not sure how that works. 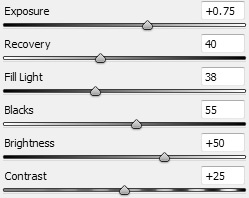 The curve adjustment can essentially do the same thing as the contrast slider, but it gives more control on where to apply the brightening or darkening effects. I’m working on a dedicated post just for the contrast curve adjustment tool inside ACR, and it should be out next week with more sample images and histogram comparisons. Pingback: How Well Do You Know Your Curves?